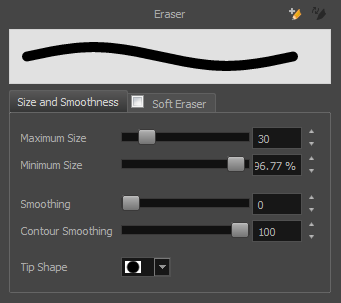 The Eraser tool is pressure sensitive, like the Brush tool, giving you more precision when erasing parts of a drawing. You can also use the Select tool to select drawing objects and delete them instead of erasing. It is a good idea to create and save erasers with precise sizes and parameters in order to save time when drawing and designing. There are two icons located at the top, right corner of the Eraser Properties window. One is to create a new preset, while the other is to update the currently selected preset. Use them after you have set all the parameters for the new eraser preset. ‣ New Brush Preset: Click on this button to create a new eraser brush style. The new eraser style will appear at the bottom of the list in the Presets section of the Tool Properties window. All the values and selected options in the Eraser Properties window will be attributed to this new style. 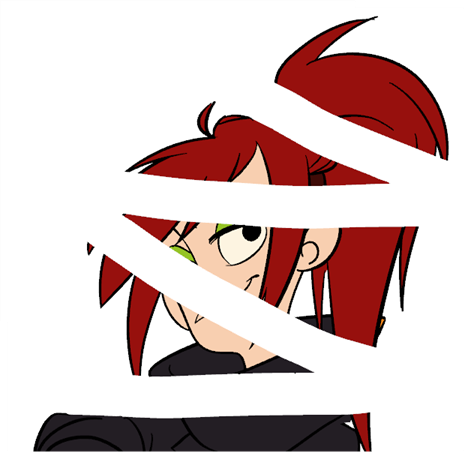 ‣ Update Preset: Click on this button to update the selected eraser preset with any changes made in the Eraser Properties window. If you make changes and do not click on the Update Preset button, then all the changes made will only be applied to the selected eraser preset temporarily. The moment you switch to another eraser preset or to another drawing tool, these modifications to the eraser preset will disappear. In the Tools toolbar, select the Eraser tool . In the Tool Properties view, the preview area displays the stroke that will be produced after you customize the different parameters in the Eraser Properties view. Click the arrow button. The Size and Smoothness tab is where you set the minimum and maximum sizes of your drawing tool which will produce the thick and thin effect on your stroke. 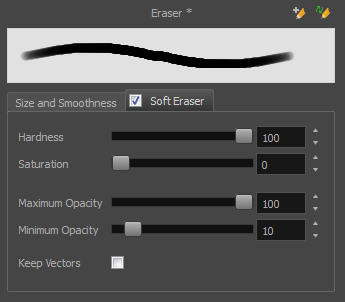 The Soft Eraser tab needs to be enable for its parameters to become active. This feature only works on soft or textured brush strokes. Both tabs works with the pressure sensitivity of a pen tablet.